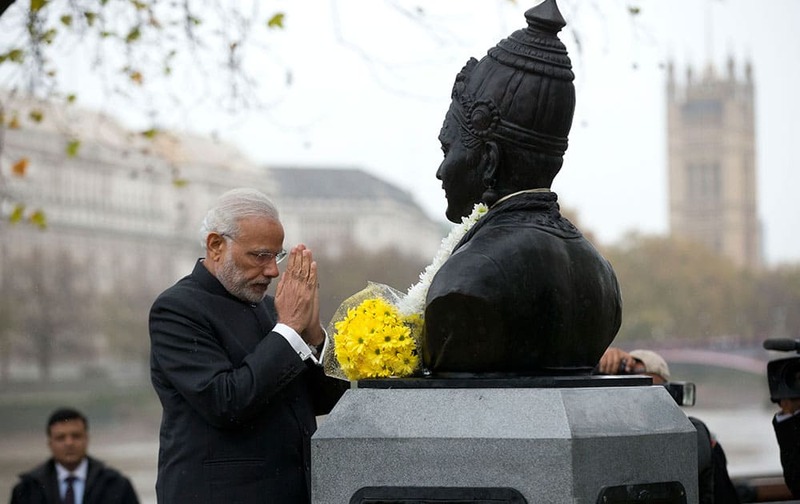 Prime Minister Narendra Modi bows his head after unveiling a statue of 12th century Indian philosopher Basaveshwara, who was one of the pioneers of the idea of democracy, in London. 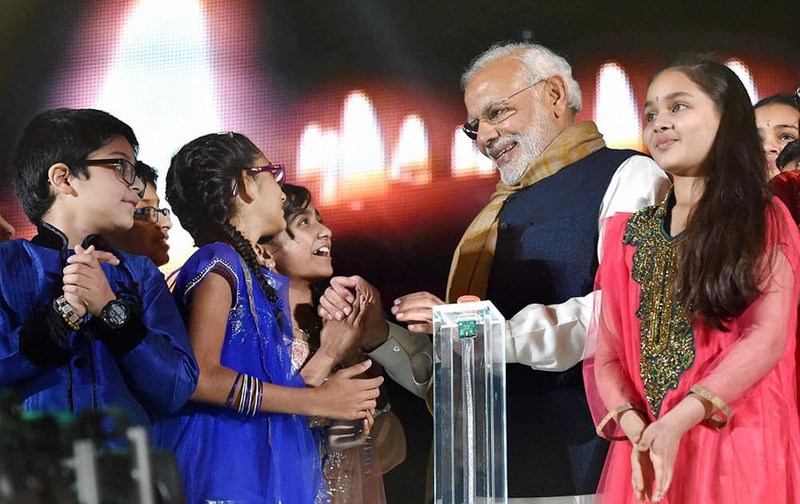 Prime Minister Narendra Modi interacts with children after addressing the Indian community at Wembley stadium in London. 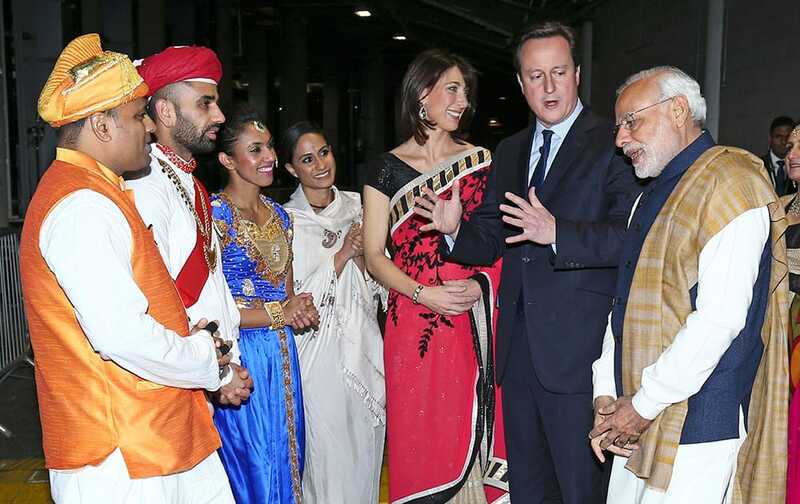 India's Prime Minister Narendra Modi with British Prime Minister David Cameron and his wife Samantha, meet artists and performers in a backstage area at Wembley Stadium in London. 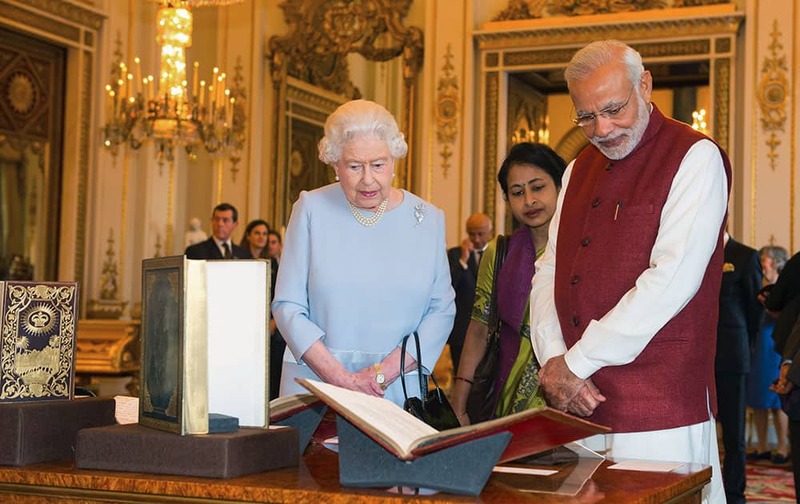 Britain's Queen Elizabeth II and Indian Prime Minister Narendra Modi view items of interest, put on display from the Royal Collection, at Buckingham Palace in London, on the second day of his visit to the UK. 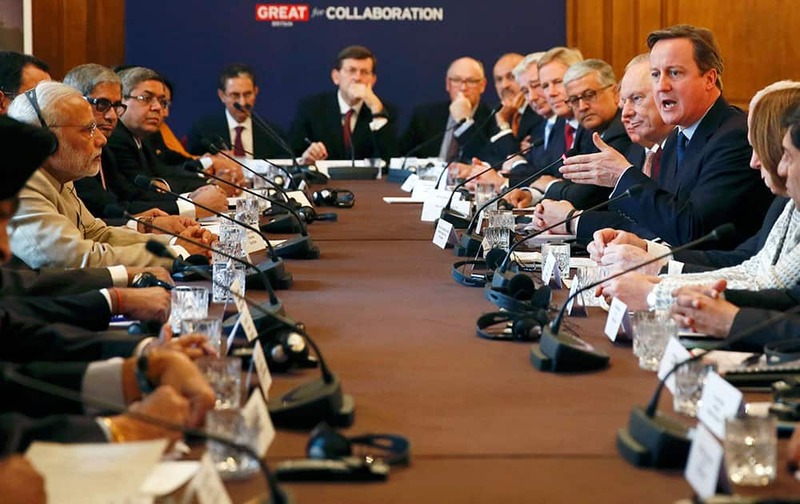 Indian Prime Minister Narendra Modi listens as Prime Minister David Cameron talks, during the CEO Forum inside 10 Downing Street in London, on the second day of his visit to the UK. 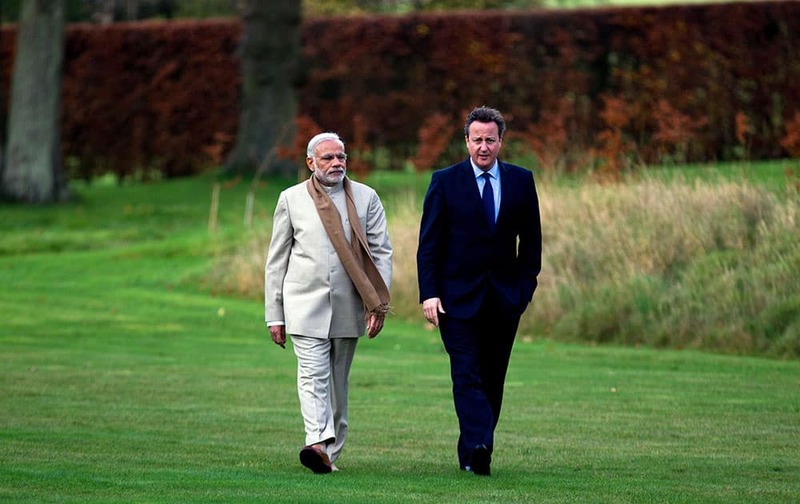 British Prime Minister David Cameron walks in the garden at his official country residence Chequers in Wendover, England, with his Indian counter-part Narendra Modi on the second day of his official visit to the UK. 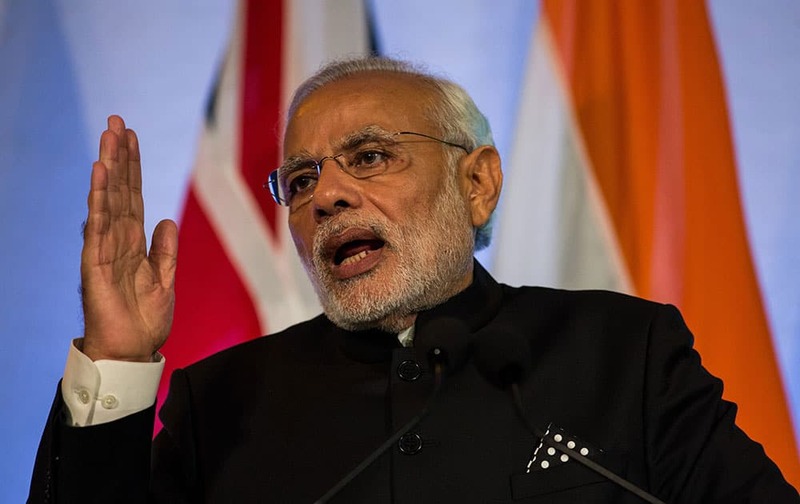 Indian Prime Minister Narendra Modi, addresses an audience of business leaders and politicians at Guildhall in central London. 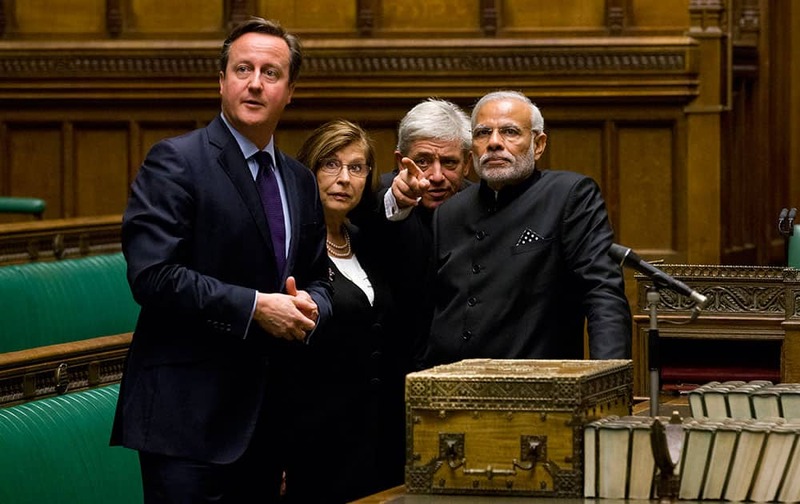 Britain's Speaker of the House of Commons John Bercow gestures standing behind the dispatch box as he, British Prime Minister David Cameron and Speaker House of Lords Baroness D'Souza, accompany Indian Prime Minister Narendra Modi on a tour of The Commons Chamber inside the Houses of Parliament in central London. 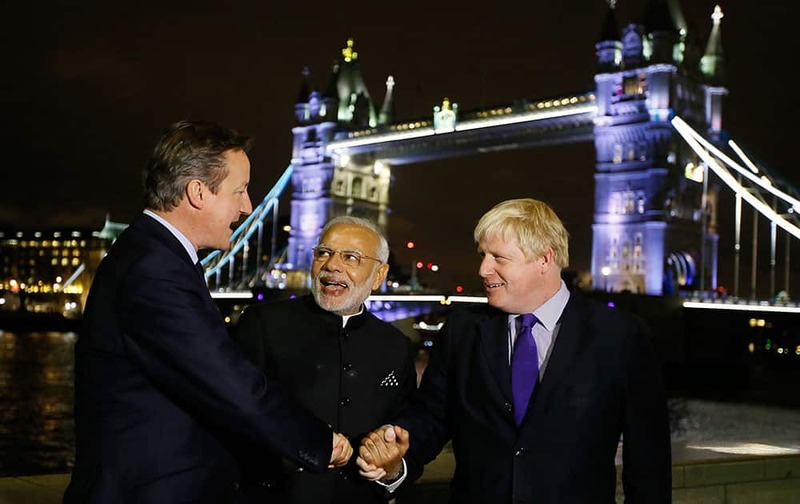 Britain's Prime Minister David Cameron with India's Prime Minister Narendra Modi and the Mayor of London Boris Johnson hold hands in front of Tower Bridge in London. 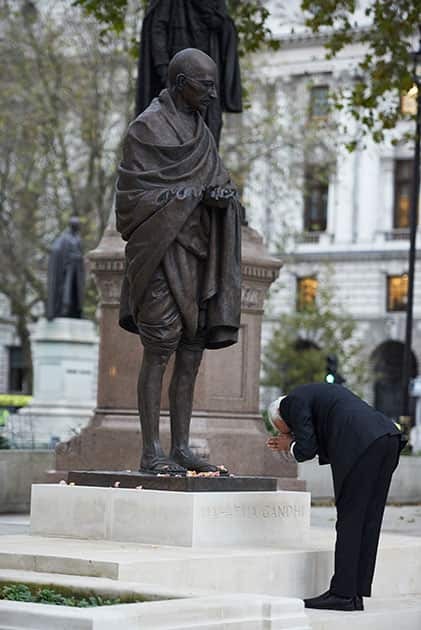 Prime Minister Narendra Modi pays homage at the statue of Mahatma Gandhi, in Parliament Square, London. 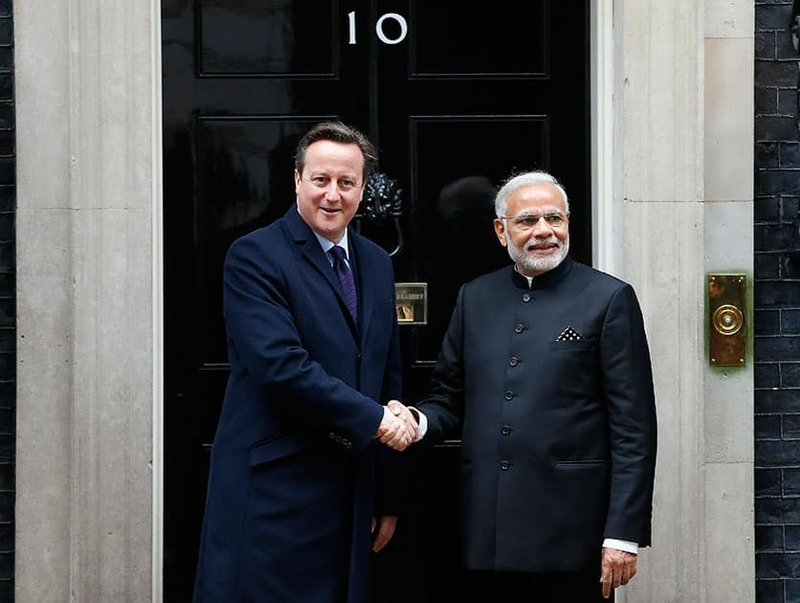 Prime Minister of India Narendra Modi is welcomed by British Prime Minister David Cameron at No 10 Downing Street in London. 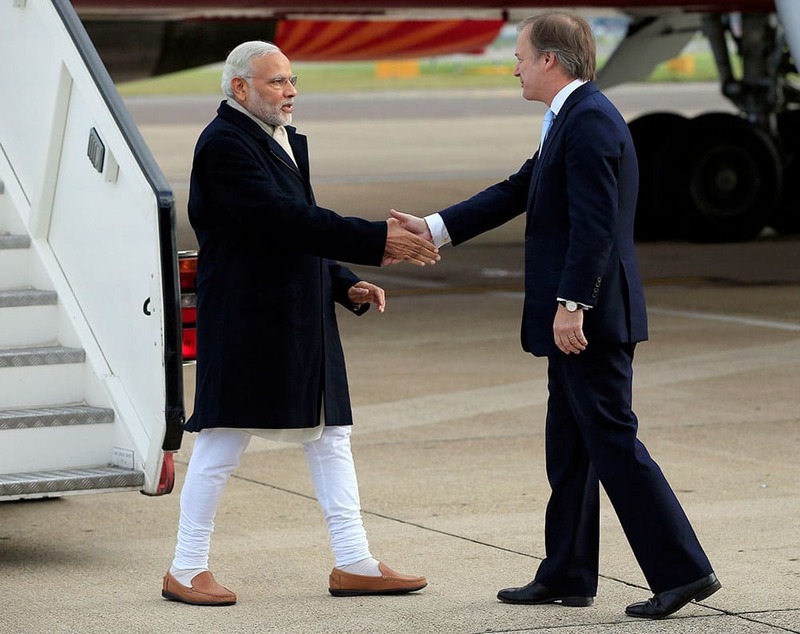 Indian Prime Minister Narendra Modi is greeted by Minister of State for the Foreign and Commonwealth Office, Hugo Swire, right, as he arrives at Heathrow Airport, London, for an official three day. 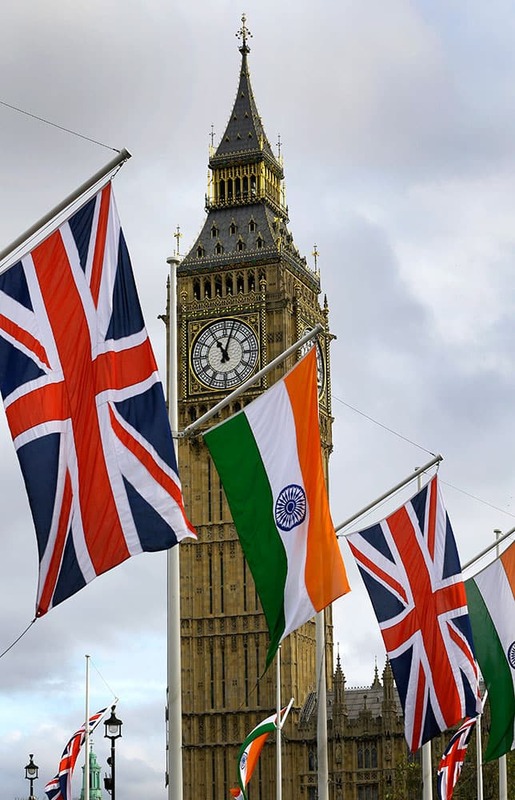 The Union and Indian flags hang near the London landmark Big Ben in Parliament Square in London. 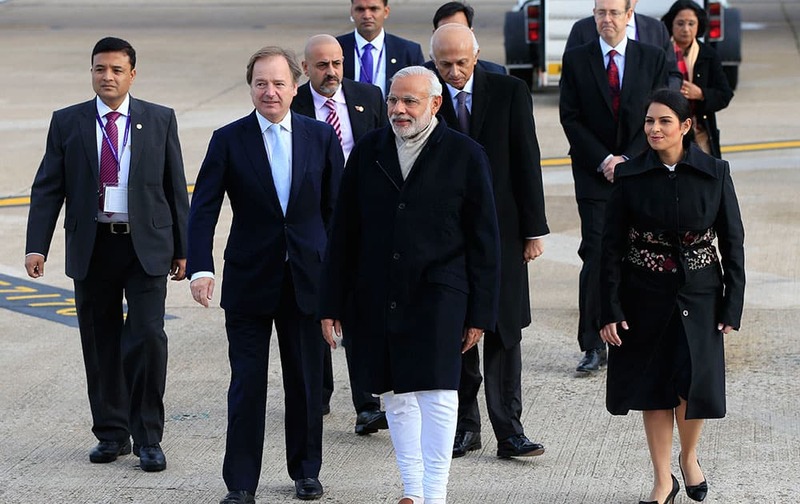 Indian Prime Minister Narendra Modi, center, is greeted by Minister of State for the Foreign and Commonwealth Office, Hugo Swire, left, and MP Priti Patel as he arrives at Heathrow Airport, London, for an official three day visit. 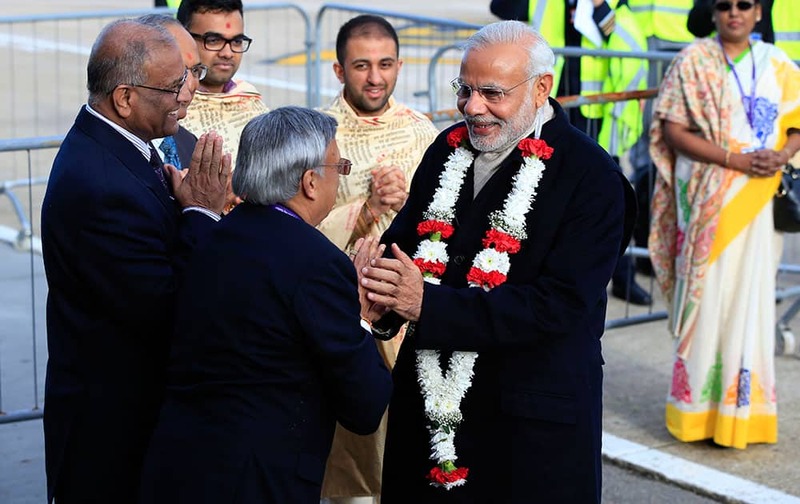 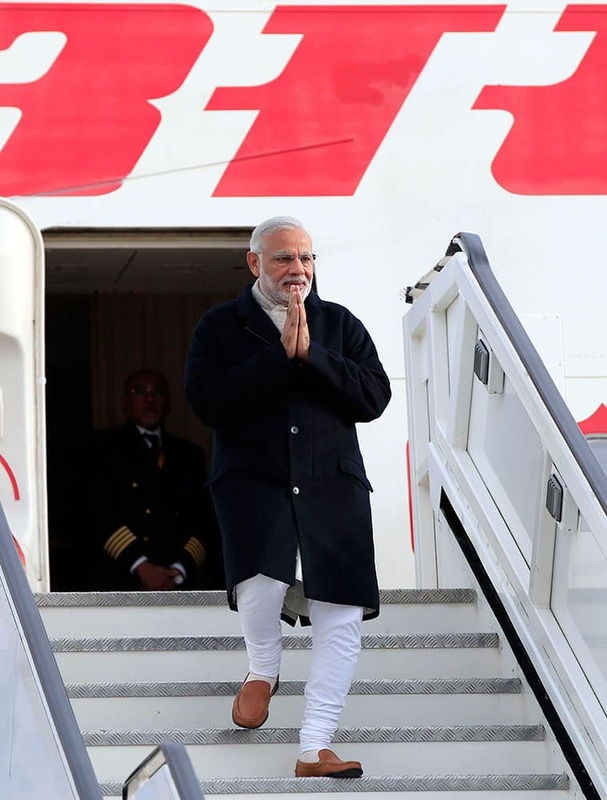 Indian Prime Minister Narendra Modi gestures as he arrives at Heathrow Airport, London, for an official three day visit. 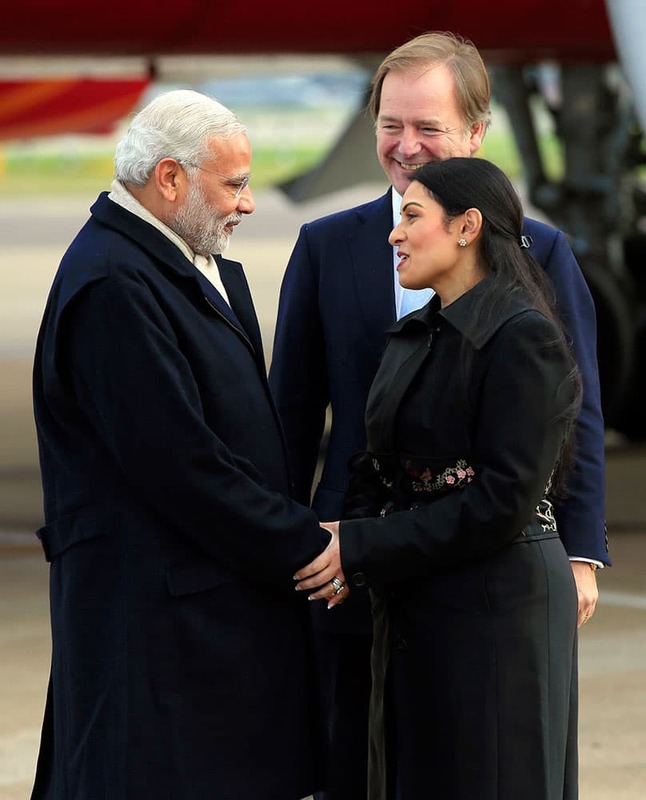 Indian Prime Minister Narendra Modi, left, is greeted by Minister of State for the Foreign and Commonwealth Office, Hugo Swire and MP Priti Patel as he arrives at Heathrow Airport, London, for an official three day visit.